You know your body needs water to function properly, but you might not be aware that drinking the right amount of water can help you drop a few pounds. Though not every popular belief about water and weight loss is true, trained nutritionists defend water's ability to help your weight-loss efforts, if you're careful not to drink too much. There's a popular misconception that water, especially ice water, can burn calories and help you lose weight. The theory goes that since your body has to warm cold water to body temperature, cold water forces your body to burn lots of calories. While the body does expend energy to warm up cold water, it isn't enough to make much of a difference. You'd have to drink 435 glasses of ice water to lose 1 lb., according to Roger Clemens, Dr.P.H., as quoted by Chow.com. Just because warming ice water doesn't burn many calories does not mean water is bad for weight loss. Drinking enough water helps your kidneys expel unnecessary water in the form of urine since it doesn't need to store it, thereby preventing water retention from showing up on the scale. Water helps your stomach feel full, thus helping you avoid overeating. Hess agrees with other health experts in stating that you should drink 8 to 10 glasses of water a day. However, sometimes people get confused as to what a "glass" is. A glass is 8 fluid ounces, which is 1 cup. An easy way to see how many "glasses" of water a given vessel holds is to fill a 1-cup measuring cup with water, then count how many cups it takes to fill the vessel to your usual fill level. The expert recommendation of eight to ten 8-oz. glasses of water aren't absolute. Your water needs vary based on your lifestyle; if you are active and losing water through sweat, you'll need to drink more. However, don't go totally overboard with water. Though it occurs rarely, it is possible to drink so much water that you wash essential minerals such as sodium out of your system. 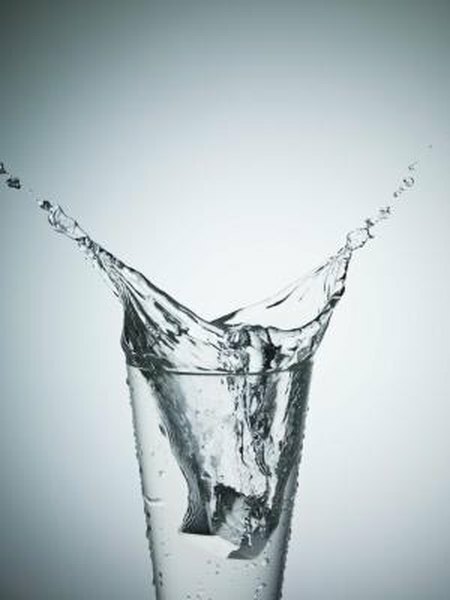 Chow.com: Nagging Question: Does Drinking Water Burn Calories?